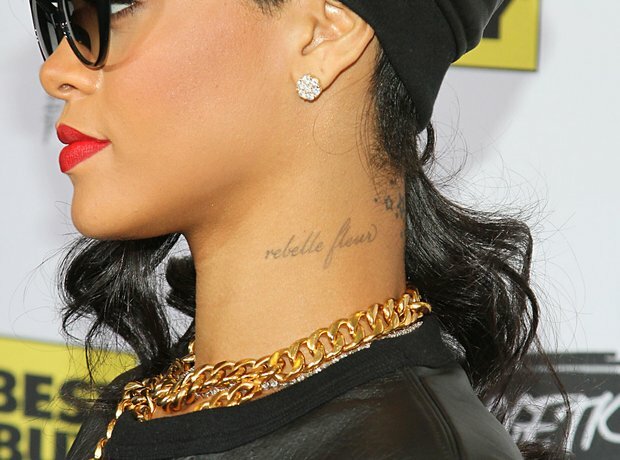 'Rebelle Fleur" on her neck. 13. 'Rebelle Fleur" on her neck. Translating to “rebel flower”, many people questioned whether the phrase should say “fleur rebelle“ in order to be grammatically correct. However, RiRi cleared this up with her tattoo artist Bang Bang, saying: "Rebelle Fleur translates to rebel flower, NOT rebelious flower, its 2 nouns so in that case fleur does not HAVE to be first!"